What Is Mastery Of Chromatic Harmonica? You will find this unique customization pretty much solves that problem. 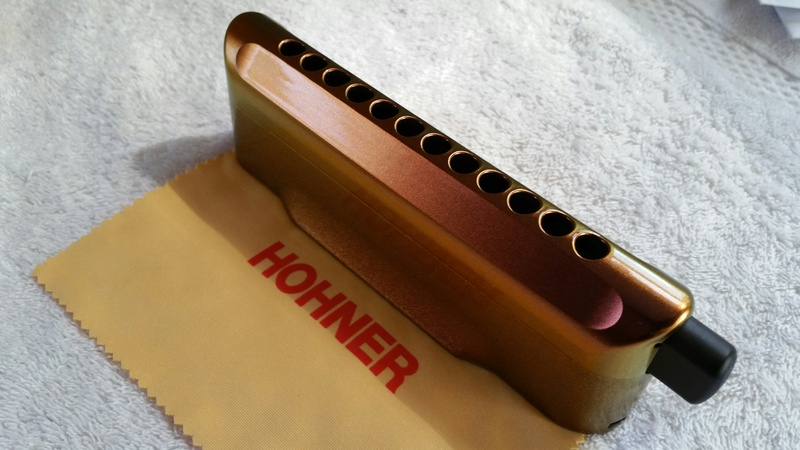 The Hohner CX 12 Jazz is a very different design, having an integral gold/orange plastic combined cover/mouthpiece…and NO mouthpiece screws and no bumpers. The comb/reed assembly simply plops into the back of the cover, and a tension bar spanning the back of the unit holds all taught. Cool, easy to assemble and disassemble, great projection of the covers so open at their back. Cool design but a bit noisy. 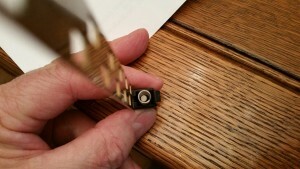 The X bang post is a very small black plastic extension of the comb (located on the right side of the black ABS comb, just a little peg really, which is 3/16″ in diameter and about a quarter of an inch below the top surface of the comb) positioned so that the white post of the slide HITS it when the slide is fully depressed, providing an end to slide movement when the slide is depressed. The X bang post has has a small + (plus sign, or X) cast on its end. Again, when you push the SLIDE in all the way, quickly, you will hear a CLICK sound as the white post of the SLIDE hits the X bang post of the comb . The photos show what i’m talking about. 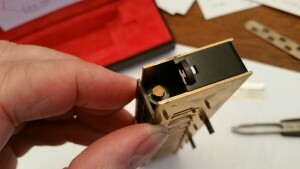 What you want to do is to provide a very thin protective layer of synthetic cork, no thicker than 1.5 index card thickness…between the WHITE POST of the slide button and the X BANG POST on the comb…but note their interface (where they hit each other) is small…a circle of about 3/8ths of an inch. Using cuticle scissors or other means, cut a very small dot of cork, then glue it to the end of the X bang post with glue. I used super glue, because it’s very thin, some recommend leather glue. When the cork is in place, the slide’s white post will hit the cork, not the raw plastic of the X bang post of the comb. 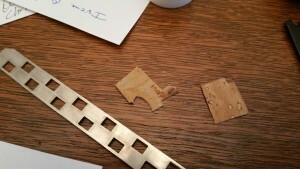 This very thin material will absorb the whack, and quiet down the slide…pretty much eliminating the noise. Apart from the peculiarities of working with and cutting a circle out of a very small piece of sheet synthetic cork, you should have no problems. 2) The second source of noise is caused by the lack of a tight fit between the SIDES OF THE SLIDE and the molded mouthpiece/cover. The fix is very simple…just use your fingertips to put a tiny amount of slide oil (I use Hetman’s Synthetic Light Bearing and Linkage Lubricant 13…often used to lubricate saxophone keys) on the slides sides and sides. Just a little, no dripping, just a very thin, light coat. This will quiet things down a bit.